A TRIP TO THE MOON—AND A DESPERATE FIGHT! The heroes of the Dinosaur Wars saga confront their greatest nemesis, the dinosaurian leader Saurgon, in his base on the moon. 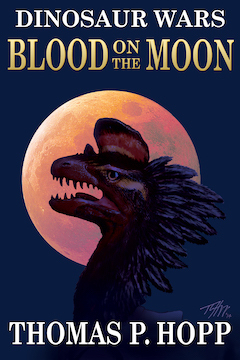 As if Chase Armstrong and Kit Daniels haven't had enough adventure, they now must confront the evil dinosaurian leader Saurgon in his moon base where he has unleashed a stupendously powerful energy beam targeting the earth. Once again Kit, Chase, and their dinosaur ally, Gar the Kra, are called upon to save humanity from destruction. Like other books in this series, this is an exciting and fun read for all ages.